This is the first time I'm participating in this wonderful meme at half-past kissin' time. (Click on the picture and you'll be taken to her site.) I've got a lot of fragments running through my mind right now, so this is the perfect time for it. When I got out of my funk and started checking out my blog again late yesterday (yep, the mood from Wednesday kinda bubbled over into yesterday too), I found a wonderful surprise. 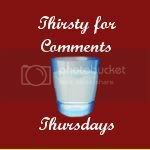 The wonderful people who host Thirsty for Comments Thursdays (and that would be Acting Balanced, Silver Faeries and Dragonflies, Thoughts 'n Such, Crazed Mama and Touristic) honored me my making Sanity's Overrated the featured blog for the day/week. They even linked me up in the top link-up spot. Thank you, guys. You really helped turn my mood around with that! Yesterday, we got news that relieved a little of my stress. University of Phoenix offered my husband another class. He's been working for them as a second job for the last couple of years. It's been pretty steady work, giving him a 5 week class or two to teach pretty close to constantly. But for some reason, the last couple months have dried up. He had one class through September, but nothing new seemed to be on the horizon. Now it is. And today, he got another class to start around the end of the time of the one from yesterday. It's taking a HUGE weight off my mind. I had a DUH moment the other day. I was coming into the living room where the boys were watching the pilot episode of Planet Sheen. There was a seen where Sheen was introducing the king of the planet he crash-landed on to the monkey (who is far more intelligent than Sheen, but then, who isn't?) that had crashed there many years before. He said something like, "This is Nesmith. He's a monkey, but we call him an ape." And it was only then that I put together those two facts along with the fact that Nesmith wore a wool hat to realize the homage that was being paid (for those that may not catch it either, Mike Nesmith was a member of The Monkees and he wore a signature wool hat in the show). And I could have slapped myself for it. I've been a big fan of the Monkees since the mid-80s when they did their first reunion tour, and I missed this completely obvious reference. And I don't have the excuse of it being the first time I watched the show. No. I've seen, in part or in whole, at least a dozen episodes where the info was right in front of my face. Yeah. Sometimes I'm a little slow. I took a big step last Sunday and played a few games of Pokemon with people that were NOT in my family. It wasn't as scary as I thought it would be. I may do the same on Sunday... or I may shop at Goodwill for Halloween Costumes. Speaking of Halloween, I wish my boys would make up their minds. First Teddy wanted to be the Hulk. Now he wants to be Ash from Pokemon. I'm actually ok with him being Ash because I've got a lot of the things for that already. Though now he's talking about being one of the gym leaders. Pete keeps bouncing between Pikachu (which would be easiest because, unlike Teddy, he still fits in last year's costume), Panpour and Tepig. I told them they needs to make up their minds this weekend. I'm going to Goodwill to look for things to make their costumes on Sunday. I'm catching another cold. Or maybe the same one wasn't as dormant as I thought. I'd gotten over the scratchy throat, the stuffy nose and the cough sometime in the middle of me getting the flu. But last night, the stuffy nose came back and this morning, the scratchy throat is. Time to start pounding the zinc! I'm thinking of starting a weekly meme. Just a fun little thing to do and, hopefully, get others to join in the fun. I was going to start it today (it will be called, tentatively "Friday Favorites") but I haven't had a chance to build a button for people to snag for the hopping. So I'm hoping next week will be a little calmer, both in terms of stress levels and things I need to do. But watch this space for a new meme! Finally, I had to buy a webcam today for something Rich needed it for, It's the first one I've had in... probably 5 years or so. It's so much smaller than I'm used to! But I am hoping that, having it hooked up to the desktop, I may be able to start doing some vlogging once in awhile too. Thanks for stopping by and reading the fragments of my mind. If you're interested in more fragments, head on over!